1. Healing Soul Mates These are friends who arrive with intention and provide you with life lessons that clear blocks from your past by mirroring you. Healing soul mates show up by divine timing — exactly when we most need to learn what they have to teach. These friends help us learn how to move forward. A healing friendship exists only as long as your purposes are aligned. How Do You Recognize One? When the relationship or friendship escalates fast. This type of friend usually shows up when you are dealing with repetitive patterns and attempting to work through old issues. How Do You Nurture This Relationship? Know up front that this friendship might not last. Like all relationships, it only works if the two of you can respect each other's need for space and come together with understanding at other times. The intense bond can be redolent of a sibling or romantic relationship. The friendship may have lots of ups and downs, but if you can take the good with the bad, this type of relationship will be very fruitful. 2. Past-Life Soul Mates Because these people might have been a lover or soul mate in a past life, the relationships feel easy and comfortable. The connection is instant. You might feel like you will be friends forever — no matter how much time passes or how far apart you are geographically — and you're probably right. This friendship will likely last for a lifetime because you will never want to run or hide from these friends.These relationships can be carefree, but they also shape us. They teach us to trust and believe in ourselves. In this dynamic, both people feel comfortable telling each other anything. Nothing is off limits. You are accepted for who you are. These are the friends who help you grow into the person you're meant to be, and have the special ability to propel you toward your destiny without pain or suffering. Often, we try to turn these relationships romantic, but it is usually impossible. There's a lack of physical attraction or a desire to sustain and protect your friendship. How Do You Recognize One? You meet this type of person when you're truly being yourself. Past-life soul mates appear when you're in your element and you don't hold anything back. They always have your best interests at heart and will stop at nothing when asked to help you accomplish your dreams. This type of friendship will last a lifetime. How Do You Nurture This Relationship? Stay connected. Check in by email or phone, just to say you’re thinking of them. These people come in and out of your life when you need to be directed, and they always bring love and fun. They help bring you back to your inner desires and reconnect you with your abilities. They are crucial in shaping you into the best person you can be. How Do You Recognize One? Karmic soul mates have a twinlike connection. In times of intense emotion, you actually feel what they feel. Often, these mates have been reincarnated and are reliving some karma to break a negative cycle. How Do You Nurture This Relationship? Be aware of the energy you emit, and do your best to remove your ego. If you focus on the positive aspects of the relationship, you will draw positivity from this person. Remove your ego by focusing on what is best for the both of you. Do your best to give unconditional love and understanding to your partner. Unconditional kindness will make your soul mate feel at ease. How Do You Recognize One? You'll feel like you have known the other person for many lifetimes, and you will rarely want to be apart. Before long, twin flames start to make collective decisions on everything. How Do You Nurture This Relationship? The most important aspect of a twin flame relationship is honesty, but relating to your twin flame feels natural and easy. You can probably easily communicate even without words. 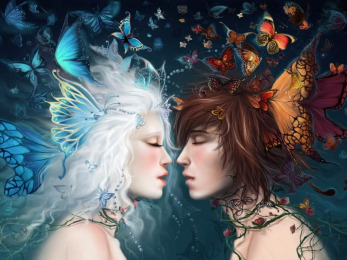 When both are completely themselves, twin flames can overcome anything. Every one of these relationships has the potential to end in heartbreak, but each one is also an opportunity to resolve and change your relationship karma. Every relationship that you learn from, and end by moving forward with love, can be marked as a success. It doesn't have to last forever to serve its purpose.